Just put your object on a turn table and record a video with your existing web camera. My video2panorama will merge all the center slices to produce a panorama photo which can then be used as a UV map. OK, you will need to do some processing for triangles that are not normal to the camera. 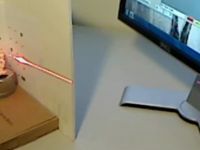 Maybe Soon you can tell us how to make a more portable 3-D Scanner using a Smartphone cam or Sony Handy Cam and a Laser Pointer and the Free Software. This would be extremely useful and handy for those on the go. Thanks this is very impressive and helpful/useful .